Amanda and Justin’s RTW trip was too awesome to confine to one blog post, so you can read part 1 here, and below is part 2 – enjoy! Argentina: Justin’s sister lives in Buenos Aires, so we got a real taste of the local culture in the area and got to meet several of her friends. BA is an extremely fun city and it’s impossible to beat the steak dinners and incredible wine at cheap prices. 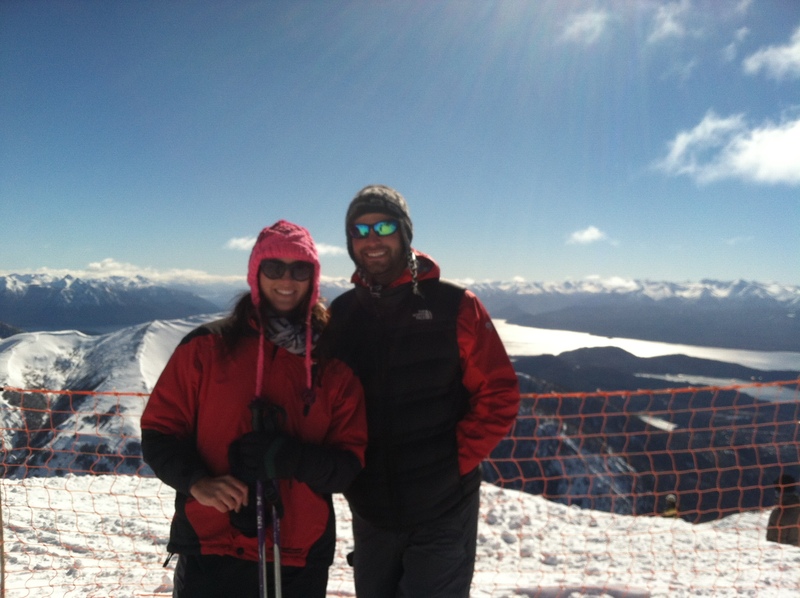 Bariloche is a ski gem, the Lake Tahoe of Argentina: fun little town, incredible natural beauty, good skiing/snowboarding, and lots more amazing food and homemade chocolate. Mendoza has amazing wine and also unparalleled natural beauty. Turkey: this country blew us both away, both by the outdoor activities, insanely beautiful landscapes, amazing food, history, culture, and fun. Our first stop was Selcuk – it’s has a great coastline and beaches, and the world-famous Ephesus ruins which were very impressive. 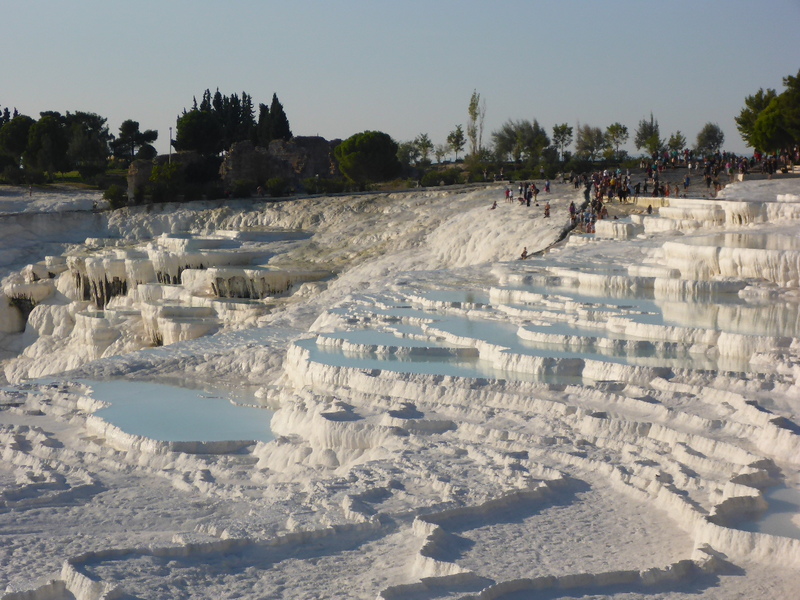 Then we went to Pamukkale, which consists of an absolutely gorgeous mountain of hot springs, “travertines,” and waterfalls. This place is impossible to describe, so we’ll let the pictures do the talking. Then we went to Cappadocia for a sunrise hot air balloon ride, exploring the impressive landscapes, and amazing food. Finally, we spent 5 days exploring Istanbul, one of our favorite cities on the whole trip. Indonesia: We spent 5 incredible days relaxing and enjoying resort life in Seminyak, Bali. We spent some time exploring the island and seeing the rice paddies, but most of the time decompressing from our hectic travel schedule, enjoying the beach, pool, and being in one place for a change. We then went to the Komodo Islands and did a 3-day liveaboard diving trip, which turned out to be by far the best diving either of us had ever done. The quality, quantity, and size (both HUGE and incredibly tiny and beautiful) of the marine life was unmatched, and the liveaboard experience was unbeatable, including delicious home-cooked Indonesian food for every meal. 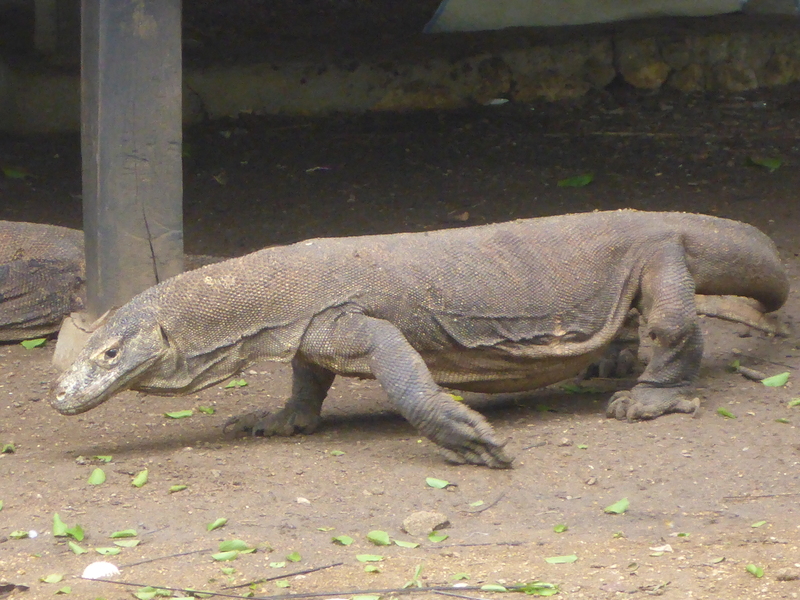 We also had the opportunity to go on land to see the famous Komodo Dragons – the only place in the world they exist! Finally, we relaxed on beautiful Gili Trawangan, which has no cars, good diving, and great beaches. 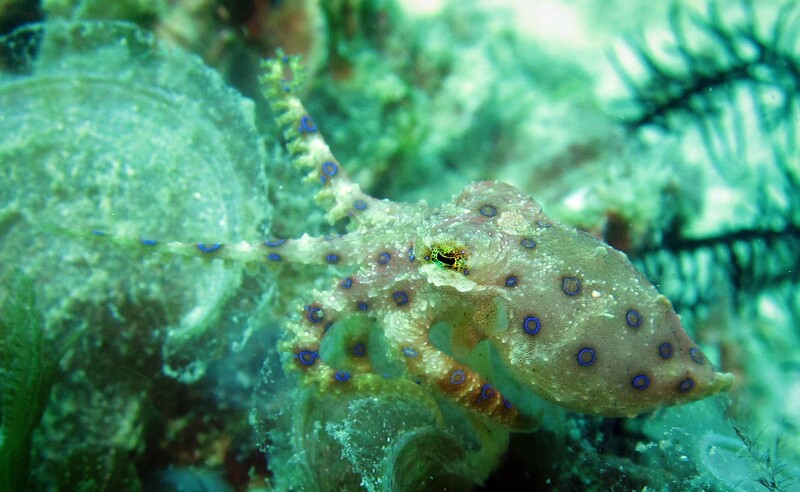 One of the most beautiful, rare, and poisonous creatures in the sea: the blue ring octopus. This little beauty was only about 1.5 inches long. Bruges, Belgium: Maybe it’s just because we didn’t know much about this town before we got there, or because the day we showed up there was a city-wide festival of music, arts, and games going on, but this place stole our hearts. Really, the only word to describe it is adorable. 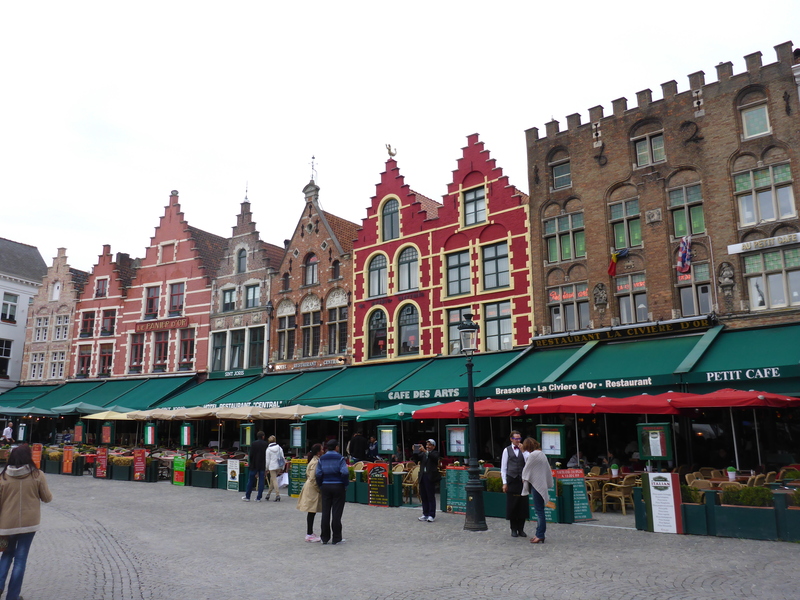 Charming architecture, fun small-town feel, INCREDIBLE selection of Belgian beers for cheap prices, amazing food (so many mussels…) and great Belgian chocolate. We could have spent much more time here. 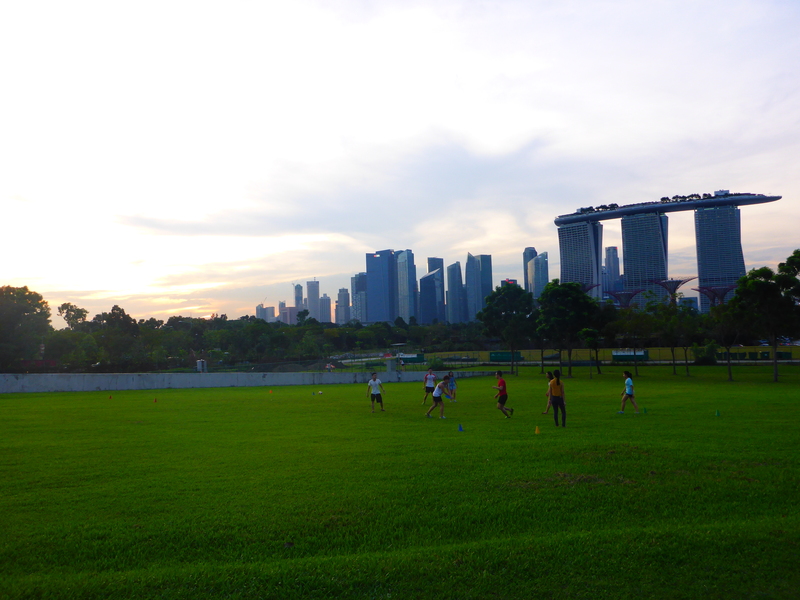 Singapore: We had heard a lot of negative things about the city-state, but we both loved it. We’ve heard it described as “sterile,” but for us it was just modern and fun. Lots of cool places to wander, stuff to see, great views from the top of the Marina Bay Sands Hotel, and some of the best street food we ate on the entire trip (the dumplings are too die for!). They have a few areas where they set up dozens of food hawker stalls that allows you to eat any kind of Asian food you can imagine: Chinese, Malaysian, Indonesian, Filipino, Thai, etc…all for cheap prices. The street food there is pretty hard to top. Yes, but really the only places we didn’t love are places that we used for transit and didn’t plan on spending any time. These cities include Lima (Peru), Zagreb (Croatia), Podgorica (Montenegro), and Vientiane (Laos). I don’t think we regretted and of the places where we actually spent time – we did lots of research and only visited places we knew we would enjoy. First, just do it. There are always a million excuses why you can’t do a trip longer than 2-3 weeks, but you won’t regret doing it. It is a lifetime of memories that are invaluable. Kindles and iPads are an absolute must for a trip like this. Both are great for long flights, bus rides, transportation of any kind really. iPads allowed us to easily download shows and movies, and we also bought lightweight USB keyboards so we could write emails to friends and family without having to hunt and peck on an iPad. Facebook can be a very useful tool to get recommendations for specific places – don’t be afraid to use it as long as you’re not being too general. Information is key!! Before you go to a new country or city, inform yourself about how much taxis should cost, whether using the meter is a custom, and what the exchange rate is to avoid being ripped off. Nothing worse than finding out later you paid way too much for a taxi ride. The exchange rate app XE was very useful for us. In general, don’t trust taxi drivers, especially at airports and bus stations! Make sure you have the name of the place you are staying on your phone (we took screen shots) to show the taxi driver. Also, try to google map how far the distance is to your accommodation so you have a general idea of what you are in for. Tripadvisor is your friend: we relied on it heavily for restaurants, activities, and places to stay. If you’ve got hotel points or airline miles, this is the time to use them – but do so in places where your points will go the furthest, and where other accommodations may be less appealing. Try to space out when you stay in nice hotels – it is something to look forward to but also critical in reenergizing for the rest of the trip. If we were moving around a lot, we would then plan to stay in a place for 4 – 5 nights (and sometimes in a hotel) so we could take a breather and regroup for the next journey. Buy a travel backpack. Don’t even think about doing this with a rollerboard or standard suitcase. We both used Osprey backpacks which held up great! Don’t take yourself or anything too seriously because, let’s face it, traveling can be stressful. There will be times that things don’t go your way or you are tested, but always remember that you are a team, in this together, and don’t hold onto the frustration. It’s okay to be frustrated at times but look, it’s all part of the adventure. Just shake it off as best and as quickly as possible. You don’t want it to ruin the trip or your partner’s experience! Bali, Indonesia – The W (in Seminyak): Best Splurge! If you have the points to spend, this is the place to use them as it is one of the most beautiful properties. The rooms, pool, restaurants, private black sand beach and famous buffet breakfast are AMAZING in addition to employing the friendliest staff around. Istanbul, Turkey – The W: Very swanky hotel. Extremely helpful staff and wonderful customer service – great location! Krabi, Thailand – The Sheraton: Huge, open property with multiple pools, lots of greenery, private beach access and a fully equipped spa. Definitely great for pure relaxation. Singapore – Singapore Dorsett: New hotel, extremely modern and down right cool. Beautiful rooftop pool and gym in addition to being right next to Chinatown which has some of the best food stalls ever. Kuala Lumpur, Malaysia – The Sheraton Imperial: A stunning hotel with some of the nicest staff. Outdoor pool is beautiful and the rooms are spacious. Banos, Ecuador – Princess Maria: Clean, friendly / helpful staff and ridiculously cheap! Cusco, Peru – Hotel Ninos: Hostel that is also a charity and supports children in need. Yummy, inexpensive restaurant, heaters in the room and hot showers. Mendoza, Argentina – Hostel Lagares: Extremely friendly staff, great security, nice outdoor patio and common area – 100s of DVDs you can watch for free! Amsterdam, Netherlands – Backstage Hotel: Ridiculously nice staff, trendy, music themed rooms with vanities and drums as lights on the ceilings, cool bar downstairs and amazing location – one of our favorites! Lake Bled, Slovenia – Jazz Hostels and Apartments: We got an apartment which was fully equipped with kitchen, dining area and bedroom. Super clean, spacious and the husband and wife that own it are the friendliest people. Selcuk, Turkey (Ephesus) – Attila’s Getaway: Beautiful outdoor area with pool, tables and lounge chairs. Free coffee and tea each morning, walking distance from Ephesus and absolutely delicious home-cooked dinners included. A mini bar is on the property as well – you will not be disappointed. Vang Vieng, Laos – Phongsavanh Resort: Tucked away from the main part of town providing a quiet stay (5 minute walk to the main strip). Friendly and helpful staff, great breakfast and smoothies and spacious rooms – very cheap too! Gili Trawangan Island, Indonesia – Scallywag’s Resort: This is more of a hotel at about $100 / night but worth it. You get your own private villa with a part indoor / outdoor bathroom and shower that are wonderful. The pool is great and you can have drinks served to you while you swim. Also, has a sister hotel on Gili Air that you can take their speed boat to for a day – great way to see 2 Islands. Komodo National Park (Flores Island), Indonesia – Wicked Diving: We did a 3 day / 2 night liveaboard with this dive company and it was one of the best experiences of the trip. Amazing and hilarious staff, great boat, unbelievably delicious food and world class diving. You MUST go with them if you dive in Komodo…a must.